The Artool™ CUTTING MATS are the most flexible cutting mats on the market today because they're made of a new, 3-ply high-tech polymer material. 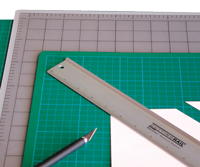 Constructed with a self-healing surface, Artool™ CUTTING MATS are extremely durable and hold up under repeated use with art and mat knives or rotary cutters. If an Artool™ CUTTING MAT should become bent or distorted, simply heat it in sunlight or hot water until it becomes pliable and then lay the mat flat. The translucent mats are perfect for light tables and cutting projects where a coloured mat is not desirable. When these mats are not being used for cutting, they make a perfect surface for drawing or writing, thanks to the resilient texture of the 3-ply construction. Artool™ CUTTING MATS are the ideal choice for artists, designers, photographers, illustrators, calligraphers, scrapbookers and hobbyists.